Results: Twenty patients underwent continuous osteotomies, and 40 underwent intranasal perforating osteotomies. The continuous osteotomy technique had a preoperative to postoperative decrease in the ventral width of 7.0% (P .01). The perforating osteotomy technique had a decrease in the ventral width of 3.6% (P .001). Neither technique resulted in a statistically significant change in dorsal width (P .25). There was no significant difference in ventral and dorsal narrowing when comparing continuous osteotomies to perforating. Conclusions: Both the continuous and perforating osteotomy technique resulted in a decrease in the ventral nasal bone width. No statistical difference was found between continuous and perforating osteotomy techniques in the amount of nasal bone narrowing (P .25). 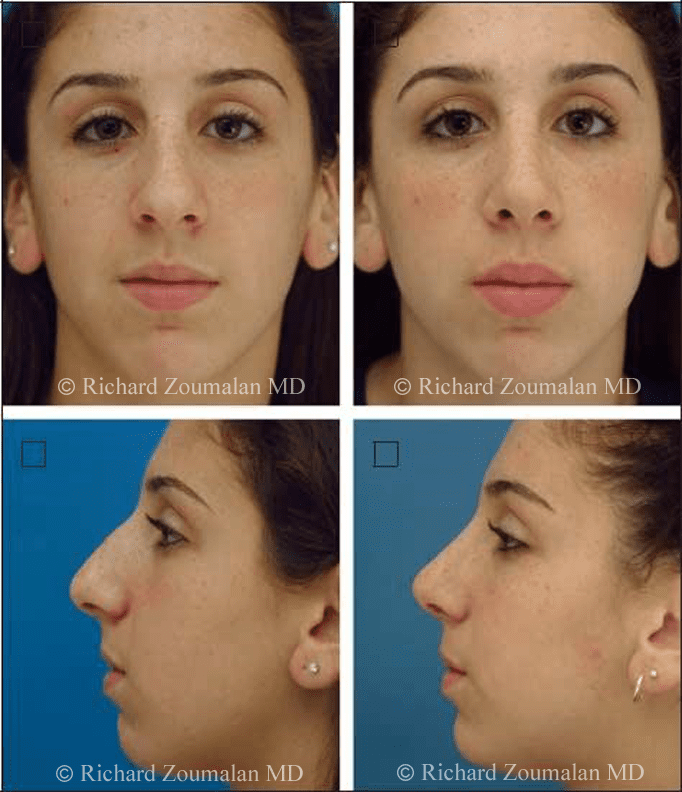 Lateral Osteotomies are used in rhinoplasty to narrow the nasal bones, close the open roof deformity after hump removal, and achieve symmetry of an asymmetrical framework. The 2 basic techniques for performing lateral osteotomies are continuous and perforating. The continuous lateral osteotomy creates a single fracture along the lateral portion of the nasal process of the maxilla and nasal bones. The perforating osteotomy creates a series of postage stamp–type perforations along the same line as the continuous osteotomy that are connected by digital infracture to mobilize the nasal bones. graphs. Ventral width is the distance between the points at which the flattened surface of the maxilla meets the ascending nasal process of the maxilla (Wb). Figure 1B depicts a pyramidal frustum on a patient’s photograph. Several studies have compared continuous vs perforating osteotomy techniques with regard to postoperative bruising and ecchymosis. Gryskiewicz and Gryskiewicz2 demonstrated that internal perforating osteotomies with a 2.0mm straight osteotome significantly reduced postoperative swelling and ecchymosis compared with continuous lateral osteotomies with a 4.0mm guarded osteotome. Perforating internal osteotomies gave better results than the transcutaneous perforating technique with regard to postoperative swelling and bruising. Likewise, Tardy and Denneny3 showed that a perforating osteotomy performed with a 2.0mm osteotome reduced tissue disruption and bleeding compared with continuous osteotomies. In a study using endoscopic evaluation of cadaveric nasal mucosa, Rohrich et al4 showed that the perforating technique produced fewer mucosal tears than the continuous technique. Eleven percent of the perforated osteotomies resulted in mucosal tears as opposed to 74% of the continuous osteotomies (P .001). Few studies have attempted to quantify the effects of osteotomies on nasal narrowing. Recently, Kortbus et al5 examined the effects of continuous osteotomies on ventral and dorsal nasal widths. They found statistically significant changes in the ventral width without any change in dorsal width. 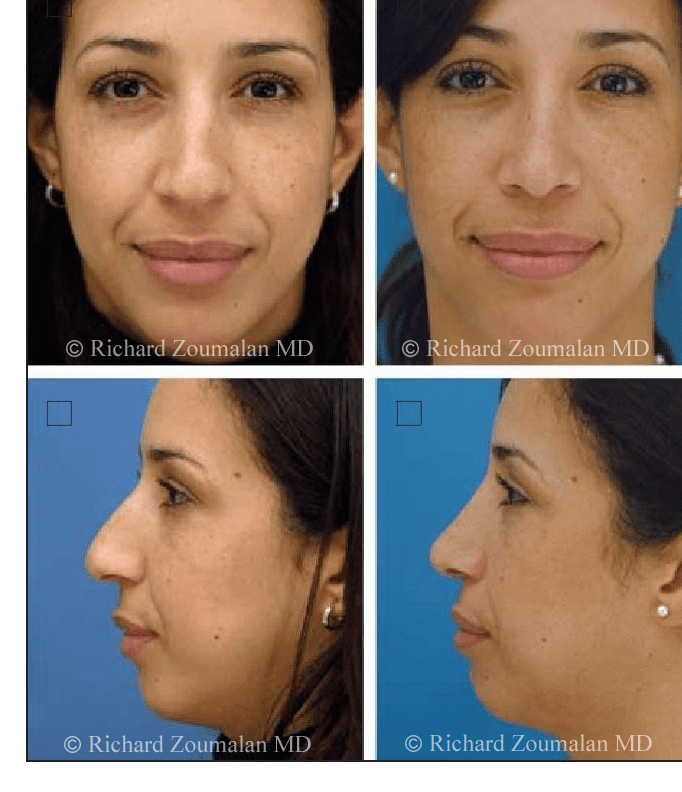 The maintenance of the dorsal width was attributed by the authors to all cases being reduction rhinoplasties requiring closure of open roof deformities. We compared the narrowing achieved by continuous and perforating osteotomies based on quantified measurable photographic changes of ventral and dorsal nasal widths. An institutional review board–approved retrospective analysis of the senior author’s (M.C.) rhinoplasty database took place from May 2000 to December 2006. The senior author (M.C.) was the surgeon for all patients included in the study. All patients had a minimum of 6 months of postoperative follow-up. Preoperative and postoperative photographs were taken using a Canon digital camera with a 100mm Ultrasonic lens (model EOS D30; Canon USA Inc, Lake Success, New York) in a standardized fashion by a single photographer (M.C.). Twopoint indirect bounced flash lighting was used for all photography. Measurements were recorded with the use of the measuring tool in Adobe Photoshop software (version 7.0; Adobe Systems Inc, San Jose, California). A paired t-test was used to analyze the difference between the preoperative and postoperative values of the dorsal and ventral widths for each of the 2 groups. To compare narrowing achieved between group 1 and group 2, a Wilcoxon signed rank test was used. For the continuous osteotomy technique used in group 1, the senior surgeon (M.C.) used the same technique for all 20 patients. First, a 27gauge needle is used to inject lidocaine, 1%, with 1:100 000 epinephrine, buffered 9:1 with sodium bicarbonate. The needle is inserted intranasally, and the periosteum external and internal to the bony pyriform aperture is injected, beginning at a level just superior to the lateral attachment of the anterior head of the inferior turbinate. Ten minutes are allowed for vasoconstriction. A 3mm incision is made transversely at this point, and the periosteum is elevated in a narrow tunnel with a Joseph elevator to protect it from being cut by the guarded osteotome. A 4mm curved guarded osteotome is inserted into the incision, perpendicular to the bony rim of the ascending process of the maxilla. The guard is palpated transcutaneously and is used as a guide for the trajectory of the osteotome. The osteotome is tapped toward the face of the maxilla with a mallet in a high to low direction until it reaches the nasofacial groove. It is then turned cephalad to cut the ascending process of the maxilla from the body of the maxilla in a low to high direction. Once it reaches the level of the nasal bones, near the medial canthus, it is directed anteriorly, to cut the nasal bone from the nasal process of the frontal bone. The bony nasal sidewall is then infractured with digital pressure. 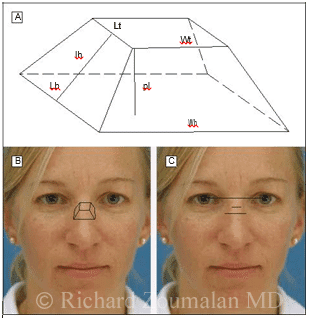 Medial osteotomies are not routinely performed in reduction rhinoplasties. In the patients included in this study, none required medial osteotomies, and none were performed. Figure 1. The pyramidal frustum. A, Lt indicates dorsal height; Lb, ventral length; p1, overall height; lh, slant height; Wt, dorsal width; and Wb, ventral width. B, A geometric design of a pyramidal frustum on a frontal photograph. C, The top line is the line demarcating the interpupillary distance. The middle line is the measurement of the dorsal width. The bottom line depicts the ventral width. There were 20 patients in group 1 and 40 patients in group 2. In group 1, 16 were women and 4 were men. In group 2, 31 were woman and 9 were men. The minimum follow-up time after which postoperative photographs were analyzed was at 6 months after surgery. The follow-up photographs analyzed were taken an average of 9.6 months after surgery. The maximum follow-up time was 16.5 months. Abbreviations: IP, interpupillary; NA, not applicable; postop, postoperative; preop, preoperative. a There was no difference in DW. However a statistically significant (P .05) decrease in VW was achieved. b Once again, there was no difference in DW. Similar to the continuous technique, a statistically significant (P .05) decrease in VW was achieved. The difference in narrowing achieved between the continuous and perforating techniques was not statistically significant (P .31). Figure 2. A patient who underwent micro-perforating lateral osteotomies by the senior author (M.C.). She also underwent dorsal hump removal and nasal tip contouring. Her measured dorsal width decreased by 2.23%, whereas her ventral width decreased by 5.93% with comparison to her preoperative photographs, taken at 12 months. A, Preoperative frontal view; B, postoperative frontal view; C, preoperative lateral view; D, postoperative lateral view. Lateral views are shown to demonstrate the amount of hump removed and lack of dorsal edema at time of photograph. In the 20 patients who underwent continuous lateral osteotomies with a 4.0mm osteotome (group 1), there was a significant decrease from preoperative to postoperative ratios of ventral width to interpupillary distance (Table). The ratio decreased from 0.29 to 0.27 (P .01), representing a 7% decrease. There was no significant difference between preoperative and postoperative values in the ratios of dorsal width to interpupillary distance (0.15 to 0.14, respectively; P .25). Figure 3. This patient underwent micro-perforating lateral osteotomies by the senior author (M.C.). Her dorsal width decreased by 1.53%, while her ventral width decreased by 3.7%. The osteotomies were also effective in improving her dorsal deviation. She also underwent a right spreader graft, dorsal hump reduction, and nasal tip contouring. A, Preoperative frontal view;B, postoperative frontal view; C, preoperative lateral view; D, postoperative lateral view. The postoperative photographs were taken at 8 months. In the 40 patients who underwent perforating intranasal lateral osteotomies with a 2.0mm osteotome (group 2), there was a significant decrease from preoperative to postoperative ratios of ventral width to interpupillary distance (Table). The ratio decreased from 0.39 preoperatively to 0.37 postoperatively (P .001), representing a 3.6% decrease in ventral width. As with group 1, group 2 had no significant difference in the ratios of dorsal width to interpupillary distance between preoperative and postoperative measurements. When the results of the change in widths using the 2 techniques were compared with each other using the Wilcoxon signed rank test, there was no significant difference in narrowing between the continuous and perforating osteotomies for both the dorsal (P .31) and ventral (P .14) measurements. Figure 4. While micro-perforating lateral osteotomies (performed by the senior author [M.C.]) in this patient decreased her dorsal width by 5.45%, she had a negligible decrease in her ventral width (0.07%). She also had a left spreader graft, which may affect the appearance of the ventral width. However, it alleviated a concavity on the left nasal sidewall. A, Preoperative frontal view; B, postoperative frontal view; C, preoperative lateral view; D, postoperative lateral view. The postoperative photographs were taken at 12 months. Figure 5. This patient underwent micro-perforating lateral osteotomies by the senior author (M.C.) and had dorsal width decrease of 2.46%, whereas she only had a ventral decrease of 2.05%. She also underwent maneuvers aimed at deprojection and rotation, which cannot be appreciated on these frontal images. A, Preoperative frontal view; B, postoperative frontal view; C, preoperative lateral view; D, postoperative lateral view. The postoperative photographs were taken at 9 months. 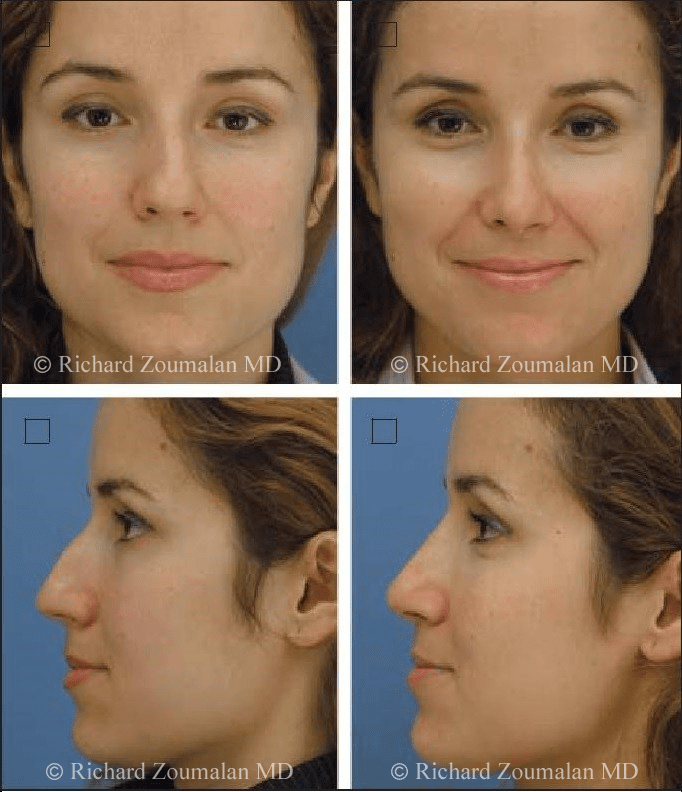 In reduction rhinoplasty, the dorsal hump is removed, which creates an open roof that widens the dorsal width. The nasal pyramid has been likened to a truncated pyramid. As one shortens the overall height of the pyramid by decreasing “pl,” the width of the dorsum (Wt) increases (Figure 1A). Lateral osteotomies fracture the nasal bones so that they can be repositioned and narrowed, that is, they close the open roof. Owing to decrease in dorsal projection and the creation of the wider open roof, hump removal and subsequent osteotomy closure are thought to widen the dorsal width postoperatively. However, this study shows that regardless of technique, dorsal width remains narrow after lateral osteotomies. These results confirm the results of our earlier study (Kortbus et al5) that hump reductions do not necessarily lead to increases in dorsal width, something that had long been accepted as true. 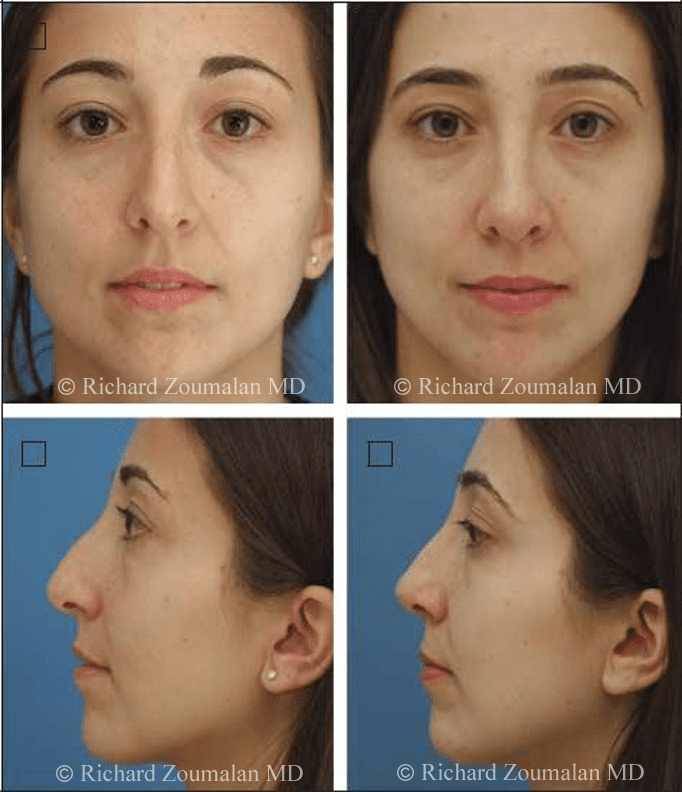 Indeed, it seems that regardless of osteotomy technique, reduction rhinoplasty can leave the dorsum narrow. Figures 2, 3, 4, 5, 6, 7, and 8 show preoperative and postoperative photographs of patients who underwent perforating lateral osteotomies performed by the senior surgeon (M.C.). 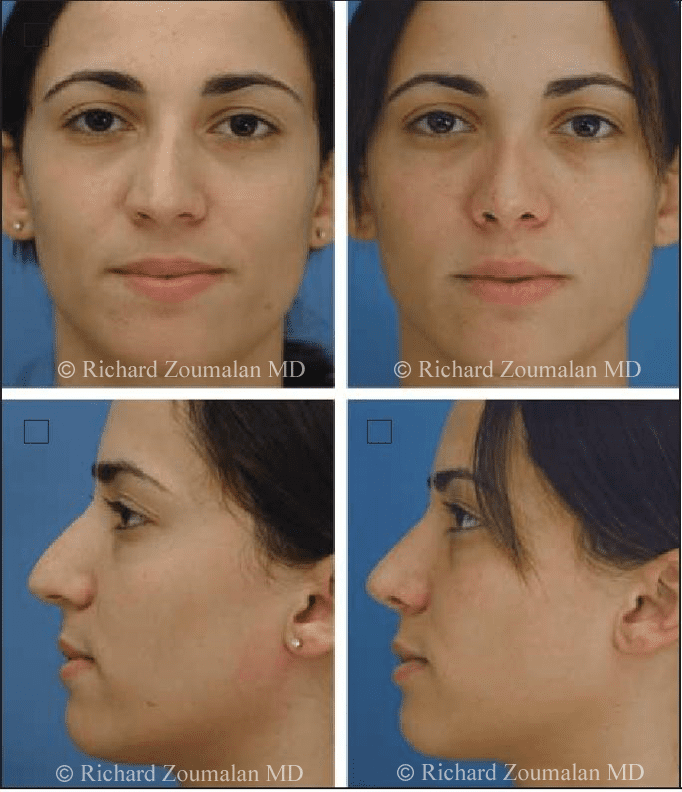 Profile views are also shown to demonstrate how much hump was removed and the lack of existence of significant postoperative edema confounding measurements. Figure 6. This patient underwent micro-perforating lateral osteotomies by the senior author (M.C.). She had a negligible decrease in dorsal width (0.08%), and her ventral width decreased by 2.1%. She also underwent dorsal hump reduction and tip contouring. A, Preoperative frontal view; B, postoperative frontal view; C, preoperative lateral view; D, postoperative lateral view. The postoperative photographs were taken at 11 months. Figure 7. This patient underwent micro-perforating lateral osteotomies by the senior author (M.C.) and had similar decrease in dorsal width (1.02%) with comparison with ventral width (1.41%). She underwent dorsal hump reduction and nasal tip contouring as well. A, Preoperative frontal view, B, postoperative frontal view; C, preoperative lateral view; D, postoperative lateral view. The postoperative photographs were taken at 14 months. Figure 8. This patient underwent micro-perforating lateral osteotomies by the senior author (M.C.). While she had a minimal decrease in dorsal width (0.56%), the ventral width decreased by 4%. In addition, the surgery aimed to correct her overprojection, which cannot be appreciated in the frontal images. A, Preoperative frontal view; B, postoperative frontal view; C, preoperative lateral view; D, postoperative lateral view. The postoperative photographs were taken at 6 months. It is not surprising that both techniques yielded similar amounts of narrowing. Both techniques create controlled fractures of the nasal bones that allow for the desired amount of narrowing. Murakami and Larrabee7 theorized further narrowing with perforating techniques owing to maintenance of soft tissues and periosteal envelope. However, our study suggests that the creation of complete fractures of the nasal bones, regardless of technique, may be the most important factor in nasal bone narrowing. In conclusion, both continuous and perforating lateral osteotomies create statistically significant narrowing of the ventral nasal width. However, there was no statistically significant difference between the 2 techniques. In addition, neither technique created statistically significant change of the ventral width of the dorsum when compared with preoperative width. 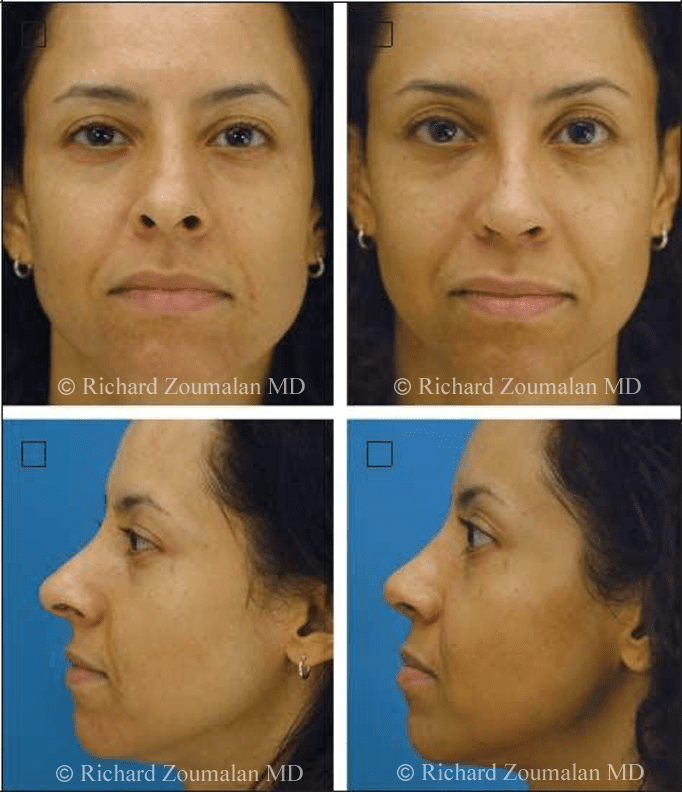 This confirms that lateral osteotomies can maintain the narrowness of the nasal dorsum despite hump reduction in reduction rhinoplasty. Shah AR, Constantinides M. Aligning the bony nasal vault in rhinoplasty. Facial Plast Surg. 2006;22(1):38. Gryskiewicz JM, Gryskiewicz KM. Nasal osteotomies: a clinical comparison of the perforating methods versus the continuous technique. Plast Reconstr Surg. 2004; 113(5):14451458. Tardy ME Jr, Denneny JC. Microosteotomies in rhinoplasty. Facial Plast Surg. 1984;1:137. Rohrich RJ, Minoli JJ, Adams WP, Hollier LH. 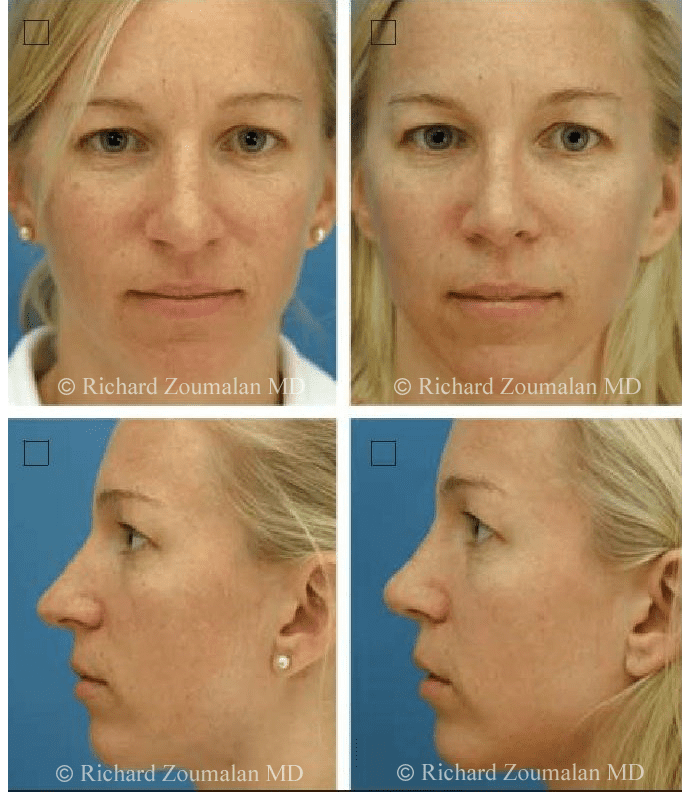 The lateral nasal osteotomy in rhinoplasty: an anatomic endoscopic comparison of the external versus the internal approach. Plast Reconstr Surg. 1997;99(5):13091312. Kortbus MJ, Ham J, Fechner F, Constantinides M. Quantitative analysis of lateral osteotomies in rhinoplasty. Arch Facial Plast Surg. 2006;8(6):369373. Westreich RW, Lawson W. Perforating double lateral osteotomy. Arch Facial Plast Surg. 2005;7(4):257260. Murakami CS, Larrabee WF Jr. Comparison of osteotomy techniques in the treatment of nasal fractures. Facial Plast Surg. 1992;8(4):209219.